Welcome to the homepage of Ballygarrett Golf Society. Based in the Wexford village of Ballygarrett, our society has 58 members with various connections to the village. Like most small rural villages, Ballygarrett has a selection of shops, pubs, a school and a church. The "home" of the society is "The Schooner" pub in the middle of the Village. It was here that the society was formed in 1999. A brief history of the society is included on the site and we have also included the constitution, general rules and some important points of etiquette. Since our foundation in 1999, we have held 9 outings per year with an AGM held at the end of each year. Over the years we have had a list of distinguished Captains and Presidents, along with many loyal and hardworking committee members. Each year our Sponsors make the work of the committee so much easier with their generous financial and other contributions to the ongoing functioning of our society. The current and past committees, captains and presidents would like to thank them for their support. You will find a list of our current sponsors on the sponsors page here. We know that all our members will support them wherever possible. Our fixtures for the season are listed on the outings page, and the results will be added as they become available. Our society is always in need of support from our members and sponsors, and if you feel there is any way that you can contribute, please contact the secretary here. We hope you enjoy your visit to our site. An application form is available here if you would like to apply for membership. Please download it, fill it in and submit it to any of our committee members. If you would like to contact us, please drop an email to ballygarrettgolfsociety@gmail.com. Updated handicaps are now available for all members here. The timesheet for our outing of to Bray G.C. this Saturday is now available here. Pictures from our first outing of the year to Blainroe G.C. are now available here. The results of our outing to Blainroe G.C. are now available here. Due to Blainroe insisting on three balls only, an updated timesheet for tomorrows outing to Blainroe G.C. is now available here. The timesheet for our first outing of 2019 to Blainroe G.C. this Saturday is now available here. The list of 2019 outings is now available. Pictures from our Hamper outing to Arklow G.C. are now available here. The results of our outing to Arklow G.C. are now available here. The timesheet for our Hamper outing to Arklow G.C. this Saturday is now available here. Pictures from our outing to Ballymoney G.C. are now available here. The results of our outing to Ballymoney G.C. are now available here. The timesheet for our outing to Ballymoney G.C. (rescheduled from Coollattin) this Saturday is now available here. The results of our outing to Carlow G.C. are now available here. Pictures from our outing to Carlow G.C. are now available here. The timesheet for our outing to Carlow G.C. this Saturday is now available here. An up to date league table after the Enniscorthy outing for this year's John Jordan Golfer of the Year trophy is now available on the Members page. Currently Pat Timmons is 4 points ahead of John Dunne And Eileen O'Brien. The results of our outing to Enniscorthy G.C. are now available here. Pictures from our outing to Enniscorthy G.C. are now available here. An up to date league table for this year's John Jordan Golfer of the Year trophy is now available on the Members page. Currently Pat Timmons is 10 points ahead of Joan Sinnott. The timesheet for our outing to Enniscorthy G.C. this Saturday is now available here. The results of our Scotch Foursomes competition at Ballymoney G.C. are now available here. Pictures from our Scotch Foursomes competition at Ballymoney G.C. are now available here. The timesheet for our Scotch Foursomes competition at Ballymoney G.C. this Friday is now available here. Pictures from our captain's day outing to Tulfarris G.C. are now available here. The results of our captain's day outing to Tulfarris G.C. are now available here. The timesheet for our Captain's Day outing to Tulfarris G.C. this Friday is now available here. Pictures from our outing to Wexford G.C. are now available here. The results of our outing to Wexford G.C. are now available here. The timesheet for our outing to Wexford G.C. this Saturday is now available here. An up to date league table for this year's John Jordan Golfer of the Year trophy is now available on the Members page. This will be updated after each outing. Currently Eileen O'Brien and Joan Sinnott are neck and neck. Pictures from our annual trip to Portugal are now available in our Gallery. The results of our outing to Bray G.C. are now available here. Pictures from our outing to Bray G.C. are now available here. The timesheet for our outing to Bray G.C. this Saturday is now available here. The results of our outing to Courtown G.C. are now available here. Pictures from our outing to Courtown G.C. are now available here. The timesheet for our rearranged outing to Courtown G.C. this Saturday is now available here. The timesheet for our first outing of 2018 to Blainroe G.C. this Saturday is now available here. The list of 2018 outings is now available. Also a reminder that our society will be holding a table quiz on Friday May 4th in the Strand Bar and we ask all out members to come support the night and bring a friend. Third times a treat, the timesheet for our rescheduled Hamper outing to Ballymoney G.C. this Saturday is now available here. The timesheet for our rescheduled outing to Enniscorthy G.C. this Saturday is now available here. Hopefully this time we will get the weather. John Downey has provided letters from Cystic Fibrosis Ireland for the raffle we did at captains days this year in Carlow. Pictures from our outing to Coollattin G.C. and Presentation Night are now available here. The results of our outing to Coollattin G.C. are now available here. The timesheet for our outing to Coollattin G.C. this Saturday is now available here. Pictures from our President's day outing to Charlesland G.C. are now available here. The results of our outing to Charlesland G.C. are now available here. The timesheet for our President's outing to Charlesland G.C. this Saturday is now available here. 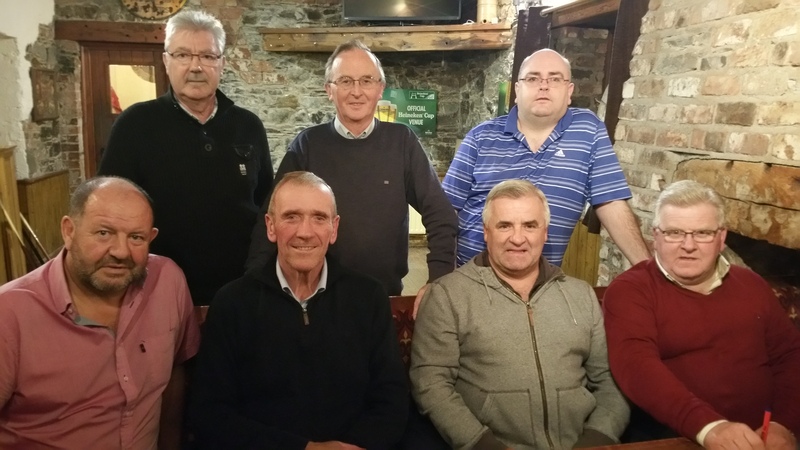 Pictures from our Captain's day outing to Carlow G.C. are now available here. The results of our Captain's day outing to Carlow G.C. are now available here. The timesheet for our captain's day outing to Carlow G.C. this Friday is now available here. The timesheet for our outing to Courtown G.C. this Saturday is now available here. Pictures from our outing to Blainroe G.C. are now available here. The results of our first outing of 2017 to Blainroe G.C. are now available here. The timesheet for our first outing of 2017 to Blainroe G.C. this Saturday is now available here. The list of 2017 outings is now available. The results of our Hamper outing to Enniscorthy G.C. are now available here. Pictures from our Hamper outing to Enniscorthy G.C. are now available here. The timesheet for our Hamper outing to Enniscorthy this Saturday is now available here. Also don't forget our AGM is this Friday in the Schooner at 7:30PM. Pictures from our outing to Coollattin G.C. are now available here. The timesheet for our outing to Coollattin this Saturday is now available here. Pictures from our outing to New Ross G.C. are now available here. The results of our outing to New Ross G.C. are now available here. The timesheet for our outing to New Ross this Saturday is now available here. The timesheet for our outing to Enniscorthy this Saturday is now available here. Pictures from our Scotch Foursomes event are now available here. The results of our Scotch Foursomes event in Ballymoney G.C. are now available here. The timesheet for our Scotch Foursomes event this Friday in Ballymoney G.C. this Friday is now available here. The results of our Captain's day outing to Mount Wolseley G.C. are now available here. Pictures from our outing to Captain's day outing are now available here. The timesheet for our Captain's day outing to Mount Wolseley G.C. this Friday is now available here. A slightly amended timesheet for our outing to Wexford G.C. tomorrow is now available here. The results of our outing to Wicklow G.C. are now available here. Pictures from our outing to Wicklow G.C. are now available here. The timesheet for our outing to Wicklow G.C. this Saturday is now available here. Pictures from our outing to Balllymoney G.C. are now available here. The timesheet for our first outing of 2016 to Ballymoney G.C. this Saturday is now available here. The list of 2016 outings is now available. The timesheet for our Hamper outing to Enniscorthy this Saturday is now available here. Also don't forget the AGM tonight at 8. Don't forget the AGM of Ballygarrett Golf Society will take place on Friday 27th November 8pm in the Schooner lounge. We ask all our members to attend. Our last outing of the year takes place following our AGM in Enniscorthy GC on Saturday 28th. This is our hamper outing and the day is sponsored by Ned O'Connor and Son builders. Dinner will be served after your game. Presentation of prizes in the Schooner 9.30pm on the night. The results of our outing to Coolattin are now available here. Pictures from our outing to Coolattin G.C. are now available here. The timesheet for our outing to Coolattin this Saturday is now available here. The results of our President's day outing to Ballymoney are now available here. Pictures from our President's day outing to Ballymoney G.C. are now available here. The timesheet for our President's day outing to Ballymoney this Saturday is now available here. Pictures and the results from our Enniscorthy outing are now available. Pictures from our Captain's day outing to Tulfarris are now available here. The results of our Captain's day outing to Tulfarris are now available here. The results of our outing to Wexford are now available here. Pictures from our outing to Wexford are now in our Gallery. The results of our outing to Courtown are now available here. Pictures from our outing to Courtown are now in our Gallery. The timesheet for our outing to Courtown G.C. this Saturday is now available here. Please make sure to arrive in plenty of time for the breakfast before your round of golf. The results of our outing to Wicklow are now available here. Also updated handicaps are now available for all members here. Finally pictures from the outing are now in our Gallery. The draw for the 2015 matchplay tournament is now available here. The results of our outing to Arklow are now available here. Also pictures from the outing are now in our Gallery. The timesheet for our first outing to Arklow G.C. this Saturday is now available here. The list of 2015 outings is now available. Pictures from our Hamper outing to Enniscorthy are now in our Gallery. Don't forget to attend our AGM this Friday 28th Novemeber at 8PM in the Schooner. Also the timesheet for our Christmas Hamper outing this Saturday to Enniscorthy G.C. is now available here. The results of our outing to Coollattin are now available here. Pictures from our outing to Coollattin are now in our Gallery as well as the final result from this year's Matchplay. The timesheet for our outing to Coollattin G.C. this Saturday is now available here. Also a reminder that our AGM this year will be on Friday 28th November. All members are requested to attend this meeting. Pictures from our Presidents Day outing to Ballymoney are now in our Gallery. The results of our outing to Enniscorthy are now available here. More results for the Matchplay have been posted and we have a new captains board ready for mounting in the Schooner. Pictures from our outing to Enniscorthy are now in our Gallery. Updated handicaps are now available for all members here. Also the latest results from the matchplay tournament are available here. The results of the Captains Day outing to Mount Juliet are now available here. Pictures from our Captains Day outing to Mount Juliet are now in our Gallery. Pictures from our Wexford outing are now in our Gallery. The results of the Wexford outing are now available. The timesheet for our next outing to Wexford G.C. this Saturday is now available here. Pictures from our Courtown outing are now in our Gallery. The draw for the 2014 matchplay is now available here. Updated handicaps are now available for all members here. Also the pictures from our first outing to Arklow are finally in our Gallery. Pictures from our Wicklow outing are now in our Gallery. The results of the Wicklow outing are now available. The timesheet for our first outing of the year to Arklow G.C. this Saturday is now available here. Updated dates for some of our outings for the upcoming 2014 season. The list of 2014 outings is now available. Membership fees are now due, to pay your sub you can contact either PJ Naughter 087-2837285 or Paul Martin 087-7674747. The annual subscription is still the same, Adults €50 and €25 for Juveniles and College students. Pictures from our Xmas Hamper outing to Enniscorthy are now in our Gallery. The results of the Xmas Hamper as well as the details from the AGM are now available. Pictures from our Presidents Day outing to Ballymoney this year are now in our Gallery. Pictures from our outing to Seafield this year are now in our Gallery. The results of the Seafield G.C. outing are now available here. The timesheet for our next outing to Seafield G.C. this Saturday is now available here. The results of the Ballymoney G.C. outing are now available here. The timesheet for our next outing to Ballymoney G.C. this Saturday is now available here. The results of the Enniscorthy G.C. outing are now available here along with pictures from the presentation night. The timesheet for our next outing to Enniscorthy G.C. this Saturday is now available here. Pictures from our outing to Mount Wolseley this year are now in our Gallery. Updated handicaps are now available for all members here along with pictures from the presentation night. The results of the Wexford G.C. outing are now available here. The results of the Courtown G.C. outing are now available here along with pictures from the presentation night. Pictures from our outing to Portugal this year are now in our Gallery. The timesheet for our next outing to Courtown G.C. is now available here. The results of the Wicklow G.C. outing are now available here along with the draw for the 2013 matchplay here. The timesheet for our next outing to Wicklow G.C. is now available here. The next outing in Wicklow G.C. is fast approaching on Saturday April 13th. Make sure to get your names on the timesheet by emailing ballygarrettgolfsociety@gmail.com. As you can see the web site has been revamped and updated. Keep an eye on it as we plan to introduce more features as time passes.